New diagnostic tests are needed to make vaccination against bovine tuberculosis (bovine TB) viable and the number of false positives from these tests must be below 15 out of every 10,000 cattle tested, according to research published today in the journal PLOS Computational Biology. Using mathematical modelling, researchers at the University of Cambridge and Animal & Plant Health Agency, Surrey, show that it is the specificity of the test - the proportion of uninfected animals that test negative - rather than the efficacy of a vaccine, that is the dominant factor in determining whether vaccination can provide a protective economic benefit when used to supplement existing controls. Bovine TB is a major economic disease of livestock worldwide. Despite an intensive, and costly, control programme in the United Kingdom, the disease continues to persist. Vaccination using the human vaccine Mycobacterium bovis bacillus Calmette-Guérin (BCG) offers some protection in cattle, but is currently illegal within the European Union (EU) due to its interference with the tuberculin skin test. This test is the cornerstone of surveillance and eradication strategies and is used to demonstrate progress towards national eradication and as the basis of international trade in cattle. The current tuberculin skin test has a very high estimated specificity of over 99.97%, which means that less than three animals in 10,000 will test falsely positive. 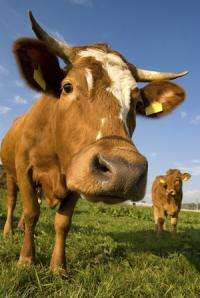 The test as carried out in Great Britain is thought to have at best an 80% sensitivity - a measure of how many infected animals will correctly test positive - missing around 1 in 5 bovine TB-infected cattle. It is used to determine if animals, herds and countries are officially free of bovine TB. Vaccinated animals that test positive have to be treated as infected animals. Under European law, if an animal tests positive, it must be slaughtered. The remaining herd is put under movement restrictions and tested repeatedly using both the skin test and post-mortem examinations until it can be shown to be officially clear of infection. The duration of movement restrictions is important due to the considerable economic burden they place on farms. The cost to the UK government alone, which depends on the number of visits to farms by veterinarians, tests carried out and compensation for the slaughter of infected animals, is estimated to be up to £0.5 billion pounds over the last ten years. For vaccination to be feasible economically and useful within the context of European legislation, the benefits of vaccination must be great enough to outweigh any increase in testing. A new generation of diagnostic tests, known as 'Differentiate Vaccinated from Infected Animals' (DIVA) tests, opens up the opportunity for the use of BCG within current control programmes. The EU has recently outlined the requirements for changes in legislation to allow cattle vaccination and a recent report from its European Food Safety Authority emphasized the importance of demonstrating that BCG is efficacious and that DIVA tests can be shown to have a comparable sensitivity to tuberculin testing in large-scale field trials. However, a key factor overlooked in this report was that the currently viable DIVA tests have a lower specificity than tuberculin testing; this could lead to vaccinated herds being unable to escape restrictions once a single test-positive animal has been detected, as the more times the herd is tested, the more likely the test is to record a false positive. In the study published today, the researchers from Cambridge and the Animal & Plant Health Agency used herd level mathematical models to show that the burden of infection can be reduced in vaccinated herds even when DIVA sensitivity is lower than tuberculin skin testing - provided that the individual level protection is great enough. However, in order to see this benefit of vaccination the DIVA test will need to achieve a specificity of greater than 99.85% to avoid increasing the duration and number of animals condemned during breakdowns. A data set of BCG vaccinated and BCG vaccinated/experimentally M. bovis infected cattle suggests that this specificity could be achievable with a relative sensitivity of the DIVA test of 73.3%. However, validating a test to such a high specificity will likely prove a challenge. Currently, there is no gold standard test to diagnose TB in cattle. Cattle that test positive are slaughtered immediately and therefore have rarely developed any physical signs - in fact, only around a half of animals examined post-mortem show physical signs of infection even if they are, indeed, infected. Dr Andrew Conlan from the Department of Veterinary Medicine at the University of Cambridge says: "In order for vaccination to be viable, we will need a DIVA test that has extremely high specificity. If the specificity is not good enough, the test will find false positives, leading to restrictions being put in place and a significant financial burden for the farmer. "But validating a test that has a very high specificity will in itself be an enormous challenge. We would potentially need to vaccinate, test and kill a large number of animals in order to be confident the test is accurate. This would be very expensive." The need for a better DIVA test was acknowledged by the Government at the end of last year. In a written statement to the House of Commons noting data from the University of Cambridge and Animal Health and Veterinary Laboratories Agency, the Rt Hon Elizabeth Truss, Secretary of State for Environment, Food and Rural Affairs, said: "An independent report on the design of field trials of cattle vaccine and a test to detect infected cattle among vaccinated cattle (DIVA) shows that before cattle vaccination field trials can be contemplated, we need to develop a better DIVA test."